I took this job thinking "great, I'll soon be able to buy a bmw r1100s then I'll find another job more exciting" then they stopped making r1100s. so I kept the job a few years more. I actually had to put money aside for 3 years untill I had enough to consider buying a new bike. and by new, I mean zero km on the tach ! one morning the rex died. the chain just broke and there I stood, silly, on the side of the road. it was my birthday (really. I remember that day for all sorts of reasons) I asked a guy if I could use his cell phone, he let me, growning and moaning, and I asked the girlfriend if she could come and pick me up. "no she said, I'm waiting for the maid and then I'll have to go to work" so I walked home. I then tested several bikes, I was watching towards bmw as I tend to use my bikes a lot. tested the r1200st (boring and ugly, I hated it) k1200r (expensive and ugly) r1150gs (expensive, high and ugly) f800s (fun but vibrating and a little weak) r1200r (nice but expensive, no top case and too much vibrations) zx12 (just for fun) and fatboy (just to say I did) vfr800 (bad seating, high end output) triumph 1050st (amazing engine, great gearbox, horrible seating position) ulysse (fun engine, horrible turning radius, too high, harley dealership) and still looking. 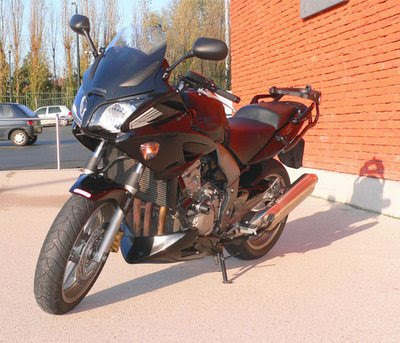 I also tested a honda cbf1000, nothing to say, you sit on the bike and you're home. I wish they had the new triumph tiger out but it was only announced for several more month. don't tell me, I know. it's ugly and it's not even a roadster. they don't do them without the ugly fairing. i rode the think 18000 km the first year, went to numerous race tracks, rode through paris, the alps to italy, the 24h of le mans, the bol dor, german highways, a romantic week end at the sea and to work every day. it could use a little more power but other than that and the ugly fairing, it's close to perfection even if it doesn't make people go woooaaa! but I'll stick my nose up your 180hp's exhaust anytime until you reach 180km/h.